The game of baseball dates back to 1839 when Abner Doubleday is credited with having laid out the first version of the game on Eli Phinney’s cow pasture in Cooperstown. While the same premises of the game laid out in 1839 have lasted the test of time, many rule changes have taken place over the 175-plus years since. Today, groups of baseball historians & enthusiasts put together “vintage games” which employ the rules and equipment of specific periods of professional baseball. These games can be likened to what “war re-enactors” do when they recreate specific military battles. Like re-enactments, the players are dressed in period reproduction uniforms and utilize period authentic equipment. The main difference though, is that vintage baseball games are real games. These games take place at open-air museums, living history villages and city parks in more than two dozen states across the United States. For the last few years, such games (matches) have taken place at Parkhurst Field (Gloversville Little League) on Harrison Street in Gloversville. These particular games are played utilizing the rules of Major League Baseball employed in 1886. In 1886 era vintage baseball, the same size diamond is used, except there is no pitcher’s mound. Pitchers instead throw from a 4′ by 6′ box with the front of the box just 50′ from home plate. The pitcher can fake a throw to any base except home. Faking to home would be the only time a balk is called. There are still three strikes for an out, but seven balls equal a walk (not four). A batter being hit by a pitch is considered only a “ball” and the batter cannot take a base. Foul balls do not count as strikes and any ball hit by a batter (even a tick) that is caught by the catcher is an out, even on the first pitch of any at bat. Any dropped third strike forces all runners to try to advance to the next base, even if bases are loaded. In fact, if a catcher drops a third strike with bases loaded, he can pick up the ball and step on home plate for an out, because the runner on third is forced to go. When a hitter approaches the plate, he must inform the umpire which “zone” he is requesting. A “high zone” is from the waist to the shoulders. A “low zone” is from the bottom of the knee to the waist. A pitcher must then throw within the “called zone” for it to be called a strike. There is no Infield Fly Rule and a fielder can purposely drop a fly ball to start a double play. The bats are wooden and the gloves used in the games would barely pass as a gardening glove or driving glove today. They have very little padding, no laces and no webbing between the thumb and fore finger. No batting helmets are used, and the ball is a bit larger than a modern baseball, is sewn in quarters and not wound as tight (less flight). 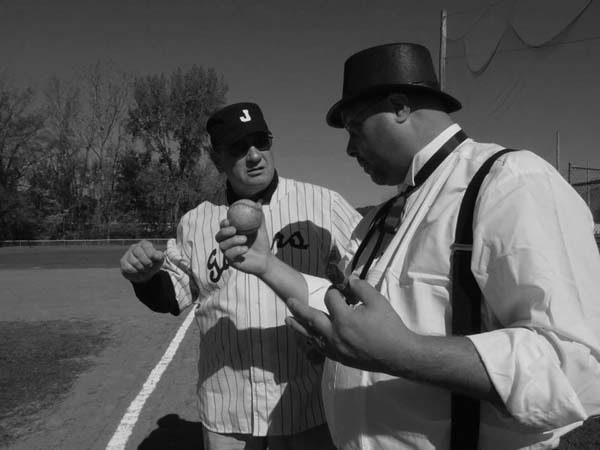 To experience a vintage game for yourself, the next Parkhurst Field Vintage Game will be taking place today at 1 p.m. It will be part of the Fulton County Baseball & Sports Hall of Fame inductions. Set to square off are the Whately Pioneers of Western Massachusetts and the A., J. & G’s of Upstate New York. The A., J. & G’s (JAGS) are a squad of local former Amsterdam, Johnstown and Gloversville Little Leaguers (now grown men). The local JAGS squad will be wearing commemorative A., J. & G uniforms that match those that the team wore 110 years ago when A., J. & G Park (Parkhurst Field) was in its professional hey-day in 1907. 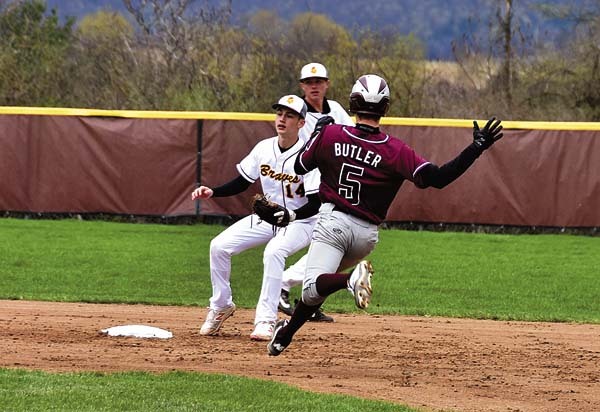 At 11 a.m., a warm-up game will take place between the Gloversville Little League All-Stars, wearing Gloversville Glovers throwback uniforms, against the Johnstown Little League All-Stars wearing Johnstown Buckskins throwback uniforms. At 12:30 p.m., the Fulton County Baseball & Sports Hall of Fame will be inducting 1951 Gloversville Glover Michael Dante. Dante played for the Glovers in 1951 as Ralph Vitti, before becoming a Hollywood actor under the stage name of Michael Dante. Dante, who is credited with roles in nearly 30 Hollywood films and 150 television shows, will be in attendance and serve as the JAGS manager for the contest. The game & inductions will also be part of the Parkhurst Field Foundations fundraiser for the “Field of Dreams Capital Campaign” that will be broadcast live on WIZR 102.9 FM and 930 AM from 9 a.m. to 4 p.m.
Former area Little Leaguers, coaches and parents will be on the air throughout the day sharing their memories of Parkhurst Field. If you are unable to attend, but would like to make a donation to the campaign, you can text 2017VINTAGE to 71777 with a pledge or go to www.parkhurstfield.org. You can also mail donations to PO Box 706, Gloversville, NY 12078. The goal of the event is to raise $50,000 towards the campaign goal of $2.3 million. Mike Hauser is the founder of the Fulton County Baseball & Sports Hall of Fame in Gloversville. If you have story ideas, old articles/photos or would like to nominate someone for the HOF, he can be reached through the organization’s website at www.fchof.com, email mhauser@frontiernet.net or at (518) 725-5565.